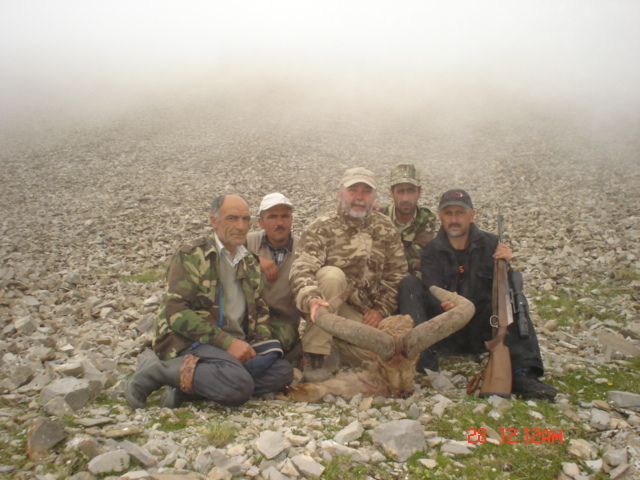 Hunting on East Caucasian Tur in Azerbaijan could be accepted as one of the most interesting and difficult ones. To get the TUR one has to be physically ready for particularities of such hunting that takes place in 2500-3000 m above the sea level. Exactly on this height East Caucasian Tur dwells. It can become a valuable trophy for a hunter. As you know in international trophy classification East Caucasian Tur are labeled as goats in Carpa World Slam and as sheep in Ovis World Slam. In order to expand your personal list of Caucasian goat Slam as well as sheep Slam you just have to get East Caucasian Tur. 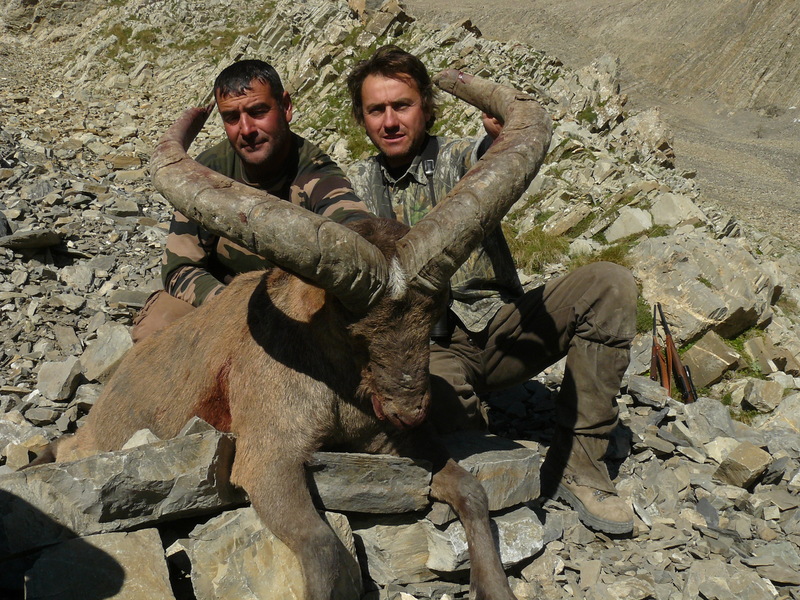 Usually our guests-hunters become owners of trophies with 75-80-90 cm. size. Hunting season begins in June 1st and finishes in October. The hottest weather lasts from June to mid September. In the daytime the temperature of air is +22-23C, at night +10C. Representatives of our company will meet you at the airport of Baku and help you with execution of custom documents as well as with the procedure of gun transportation. Visa can be issued here in the airport (CIS citizens are not required for visa). Afterwards we follow to Ismailli district on microbus or jeep accompanied by our manager-interpreter. A stop for lunch in a restaurant will be done. It will take 2.5 hours to arrive to Ismailli. Upon the arrival we will take a lorry to drive to our mountainous camp that is settled on the height of 1600 meters (41° 2’32.39″С latitude – 48°12’38.25″В longitude). The road passes through mountainous rivers and forests. The way lasts from 1,5 to 2 hours. In the camp a hunter hut is waiting for us. It has 3 rooms and intended for 2 persons. It is clean and comfortable. The hut is equipped with beds. Toilet and shower with a hot water are near the hut. The camp is also equipped with electric generator as well as with satellite communication. Menu includes dishes of national and European cosine, prepared by professional cook. It should be also noted that the whole hunting household is under the control of our huntsmen. Strangers are not allowed to hunt on the territory what favorably influences on he quantity of TUR in our household. Hunting tour lasts 5 days. As a rule guests get trophies from the first days of hunting. Hunter can also get additional trophy. Our experienced huntsmen conduct hunting from staling. However they can organize a driven as well upon the hunter’s request. The huntsmen bring a hunter to distance of 200-350 m away from hunting object. Hunting is mainly done by walking, but we frequently use horses as well. When the weather is unfavorable all necessary equipment is loaded on horseback and flying tent camps are organized on the height of 3000-3200 m. Trophies are boiled and salted, than we processing with peroxide. The animals’ skin are also handled by salt. The next day they are all packed and given to hunter along with international veterinary certificate. During the last day in Baku our guests usually take a walk around the city. In the evening they are invited to a banquet in the national restaurant. The next morning we accompany our guess to the airport.